I terribly miss you all! This poor little blog has been tucked away in the back of my head, all dust covered and lonely. So much work and wedding planning and school. How are all of you? I hope that I can get back here from time to time to say hello to you wonderful people. Hope your holidays were magical! HI! I miss you all so much! I never intended to lapse on this blog. It has always been something I have felt very passionate about and has always made me extremely happy. I guess I just let other things take over my time and then I felt silly for feeling guilty about it and I just let it go. There has been so much going on with wedding planning, school, making time for Tom, and then work, laundry, cleaning. I really would love to start posting again. It might not be as frequent as it used to be, but I really really want to! I miss all of you and I miss this connection of people, ideas, and inspiration. Thanks to all the loyal followers who are STILL following this blog even though I haven't posted since May 3rd. You guys rule. I've still been keeping up on Instagram so you can always come see me there! My username is Cherrydarling33. 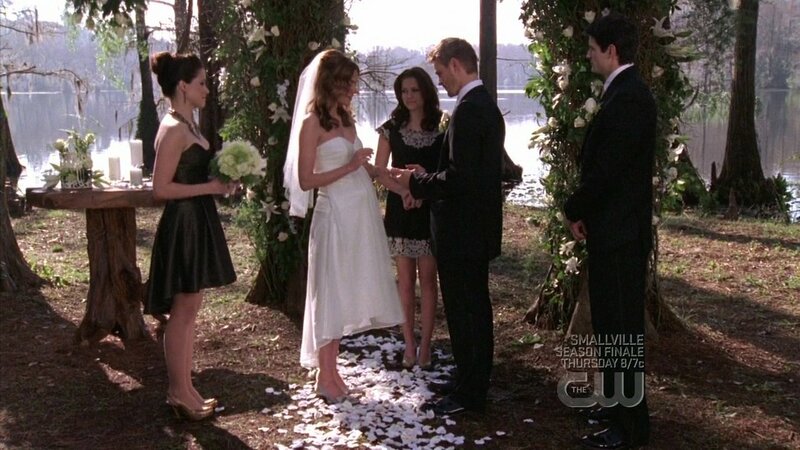 Oh, One Tree Hill. Probably one of the most addicting, cheesy, corny shows ever. But I love it. Tom and I will randomly go on OTH watching sprees and just watch old episodes for weeks on end. I love the drama and I love all the ridiculous story lines. They make me happy. But back to Peyton Sawyer. She is probably my favorite TV character ever. She was so artsy and different from any character on the show. She was always drawing, painting, and promoting bands. And I love how she was always rocking some band tees and listening to records. And her hair was always cute and curly. Yes, she can be brooding and depressing, but who isn't? She totally reminds me of how I dressed in high school, too. Plus, her hair in season 6 is my goal for my wedding hair color/cut. Yay! OHHH P.Sawyer. You rule, girl. 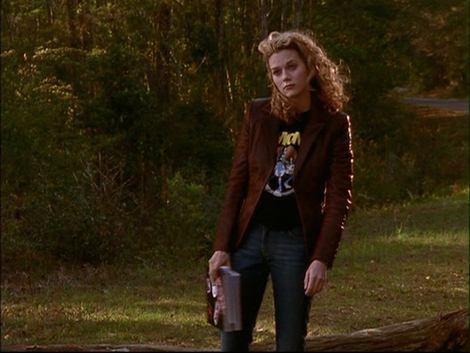 Please tell me that there are other P.Sawyer lovers out there?! Today was a rainy, dreary day. The wind and cold made themselves present as soon as I opened my eyes. My dark, warm living room was calling me right when I woke up. And today being my day off, I was more than happy to have no plans for the day. So I spent the majority of today lounging around with my little Oscar. We took a few breaks, one included a trip to Starbucks (Oscar got a puppy latte!). One included a trip to get a pedicure. But it was really one of those days when I had absolutely no desire to leave my warm house. All in all, I'd say today was almost perfect. It's nice being completely lazy every once in a while. Ever have one of those days? Remember when I said I loved polka dots? And, remember when I said I loved mint green? 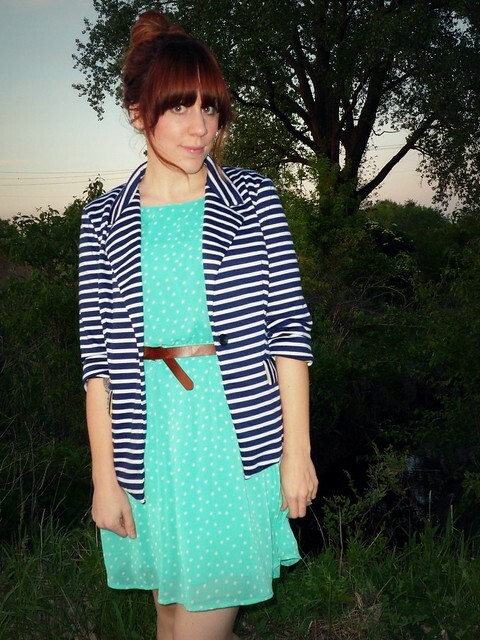 I decided to pair this dress with my fun, stripey blazer. Does it match? Nah. Is it fun? Absolutely. Sometimes introducing some funky mismatching makes me feel rebellious and saucy. The weather around here has been so exhausting lately. I never know what the day will be like. It can go from being in the 60's, drop down to the 40's, then shoot up to the 70's all in an afternoon. Needless to say, I have been doing tons of layering. It's weird because we had such a calm winter and then March had 70+ degree days. Now my body thinks it's time for fall because I have had huge cravings for all things pumpkin (mostly lattes) and a huge urge to go haunted housing and pumpkin picking. I need to get with the program. A hot, sticky summer is upon us and thinking of sweaty bangs and swimsuits makes me feel really annoyed. Oh boy. It has been over a week since my last post. What the H happened? I used to blog every day with ease and now I find it hard to blog every other day?! I hate that I have totally slacked off in this department and I am truly sorry that I've been such a flake! I guess I have been lacking inspiration and creativity the past couple of weeks and it has made it difficult to post when I was struggling with that. 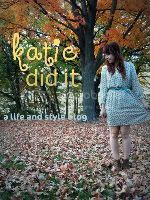 I sat down and really thought long and hard about my little blog and I was remembering back to when I first started Kate Did It, how much I loved posting every little thing that popped into my head. It left me feeling very sad that I let that joy slip away. I love this blog and I am going to continue to do so! I think everyone who blogs goes through a few rough patches. A few bad weeks. I had mine and I am so glad it's over. I'm back ladies and gentlemen. Thanks for being the awesome followers you are and sticking with me through this. I love each and every one of you and I love seeing comments from you! It seriously warms my heart to see you take time out of your day to pop over and say hello. Prepare to see me lurking on all of your blogs in the next couple of days because I have greatly missed seeing what everyone is up to! I'll be back with an outfit tomorrow. Hey everyone! I hope you all had a magnificent weekend! Mine was spent catching up and now I am back and feeling soo good about everything. Just thought I would share some photos from the last week or so! Oh my gosh, I went and saw Titanic in 3D and it was amazing! That will always be one of my all time favorite movies and seeing it again on the big screen was so stinking great. Leo is sooooo cute in that movie. Major swooning. How cute is this Marc by Marc Jacobs bag? I am still debating on whether or not I should go back and get it! AND I changed my hair up a bit! I decided to go a bit more closer to my natural color on top and kept the copper through the ends with some highlights pulled through. I love it and even though I miss my copper, I think this will be better in the long run. It's nice to be able to take a shower with warm (ish) water now. 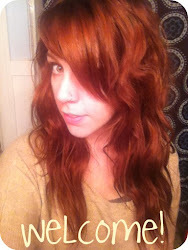 When it was copper the color faded so badly unless I used cold water on it. So hooray for warm showers!